Heat the California Garlic Oil in a large soup pot over medium heat. Add the onions and cook until soft, about 5 minutes. Stir occasionally. Add the garlic, carrots, smoked paprika and cumin and cook, stirring frequently so the garlic doesn't burn, about 2 minutes more. Add the broth, diced tomatoes, red lentils, thyme, bay leaves, salt, pepper and bring to a boil. Cover the pot, lower the temperature to a simmer and cook for 10 minutes. Add the chickpeas and cook for 10 minutes more. Take the bay leaves out and then scoop out 2 cups of the soup and puree in a blender or food processor until smooth. Add the pureed soup back into the soup pot and stir. Add more salt, if necessary. If you want the soup thicker, puree a bit more soup. Add the cooked veggies, frozen peas or chopped green beans and simmer until the soup is hot and the vegetables are warmed. NOTE: This soup can be frozen for 3 months. 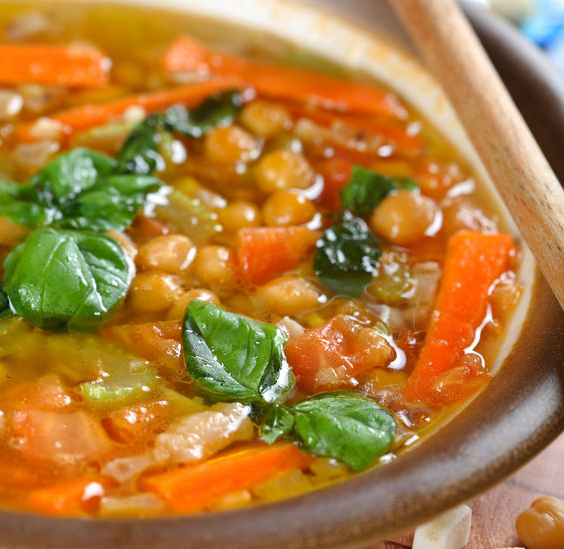 Defrost the soup in the refrigerator for 12 hours or more and then reheat it on the stove over medium heat until hot.